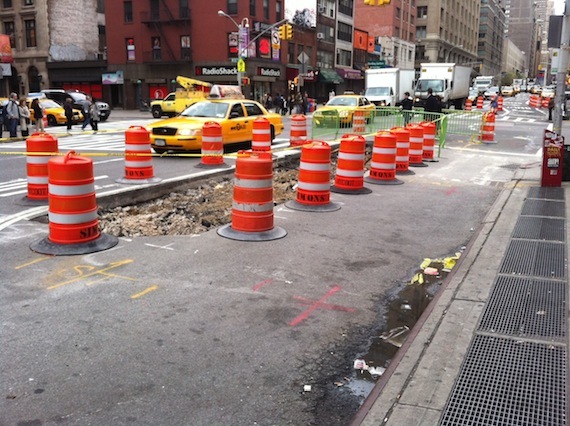 Construction is underway at the intersection of 23rd Street and Seventh Avenue in Manhattan, where DOT is building new pedestrian refuge islands and a sidewalk extension to provide some extra space around a busy subway station. The intersection, currently in the 99th percentile for severity-weighted traffic injuries in the city, will also have its signals adjusted to give pedestrians more conflict-free time to cross the street. The new plaza extends across two of Seventh Avenue’s six lanes on the southern side of the intersection. As the weather continues to get warmer, expect construction to heat up across the city. Do the bike lane opponents know about this? They may need to open up a second front. Would love to see these at all the 1 train intersections. Any change would be an improvement. I got a red light violation in my car there because I stopped in the box to wait for pedestrians crossing the street while making a left turn, and the signal changed while I was waiting. Total BS. I guess I should barreled through the crosswalk? It does not surprise me that this intersection would be in 99th percentile for injuries. I think this one has the fingerprints of the “Pedestrian Lobby” all over it! Next time take the subway….or walk! Walking is good cardio – and probably faster than a car in Manhattan. I am curious about the change in the number of travel lanes. The plans show a curb extension that extends 19 feet into the intersection. This means that there are only 3 through lanes for vehicles at the intersection, then a fourth lane is added back, just south of the bulbout on the far side of the intersection. I imagine that this will setup a situation where cars will see a wide open expanse just south of 23rd street, and there will likely be a speeding problem there. To address speeding the solution could be to drop a lane there, perhaps by adding a protected bike lane or a sidewalk extension for a few blocks. If this pushes the speeding problem farther south, then perhaps the bike lane and/or curb extensions could be pushed south as well. Very interesting. Agreed, it was a perfect day too, but I had 500+ lb of photo gear with me. I posted on some other thread about “why I drive.” Please shoot me…. You understand that they do have their quotas. When officials deny there are quotas, be reminded that all cops lie and all politicians lie. That’s the way the world is.